Voodoo Vince was a game that must have gone under my radar when it released on the original Xbox back in 2003. No idea what I was doing at the time, but the original Xbox for me was the console that got me back into online gaming, as not since the Dreamcast had I dipped my toes into the murky waters of online play. Maybe because Voodoo Vince was a single player experience I just ignored it, as I was too busy with games like Burnout to care what a voodoo doll could offer me. Nostalgia is a word I can't seem stop typing up of late in reviews, what with Yooka-Laylee still being fresh in the mind, and Voodoo Vince sort of being the same sort of game once you get going with it. Maybe then this was a terrible time to review the game, as I had a love-hate relationship with Yooka, so what could a game that turns 14 in October offer me any different. You play Vince, a voodoo doll of Madam Charmaine who at the start of the game is kidnapped along with some of her zombie dust by a bunch of goons working for a guy called Kosmo. While taking this dust its magic powers begin to scatter out into the world, bringing Vince to life and is the start of his long adventure of making his way through a New Orleans type setting as he sets out to rescue his owner. The game itself is you entering rooms and locations and working out what is needed to be done so you can progress on with the story. This can be things like finding items to make a balloon for one of the characters you interact with a bit into the game, to things such as working out a light puzzle to open a door, or finding switches to help reach a certain area. In regards to the balloon portion of the game, it did involve a lot of going backwards and forwards to complete, which in turn dragged on for a little bit too long, and did become a little bit dull with me having to push myself through that portion of the game. The game tries to combat this by having collectables on each area, making you explore and find them if you want to 100% each area. The game also gives you new a voodoo power every now and then too, but to be honest these are forgotten about once you've used them one time and you've carried on with the game. The game also has bosses too, but being an old-school boss fight these are more about completing a task to hurt it three times before it dies, rather than the HIT THESE RED BITS we seem to get a lot of in current games. For instance, one boss is a two-headed Aligator type thing called Janice, which to defeat this you'll need to climb and jump onto a trampoline on their back, then pull a switch on a platform above and then dive into a hole that opens up below to release some sort of gas. All bosses I've faced so far offer something different, and to be honest have been enjoyable to a certain degree. With something being old, it's never going to be perfect mind you. And it's not long until Voodoo Vince just starts to drag a little and become a little dull. This isn't helped in any way by a camera that likes to have a mind of its own. With moments where you would love the camera to hold one way on the screen, but the game just isn't having any of it. The same can be said for the way Vince moves, as he comes across very slow, and also having moments where a double jump would just fail to work and would see you fall down a giant hole or even more annoying a simple ledge jump. It's moments like this that really push you to the point of just not wanting to play the game anymore, and the small enjoyment it did offer at the start slowly fades behind the red mist of pointless deaths and having to restart the game if losing all your hearts. Overall: Remastered is a strong word in the case of Voodoo Vince, with it only looking slightly better in the looks department and nothing else. They could have easily just released the old version and the same annoyances away from the looks would still be there. Much like the case of Yooka-Laylee, retro fans will of course still get a kick out of playing a game they enjoyed what feels like years ago now. 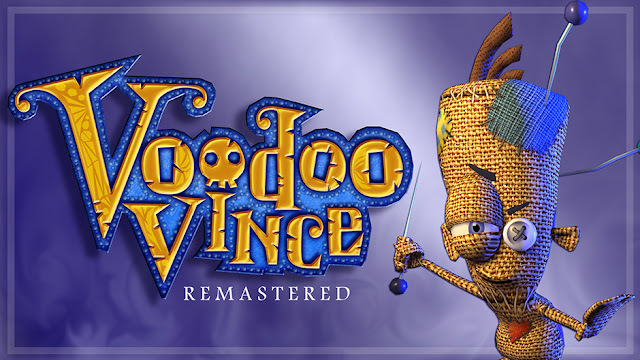 As a guy who missed the game first time around, Voodoo Vince is nothing more than your average Indie release which we see fall onto the marketplace seemingly every other week these days.